Local, fresh food and drink…watercress cocktail, anyone?! You can find the Sousa Law stand down Station Road, near the Swan pub – your kids can decorate fans… or their faces, with glitter, and make friendship bracelets! There will also be incredibly delicious tray bakes available – come and have a taste! So the Alresford Watercress Festival is upon us once again and Sousa Law is delighted to have participated in this event for over three years now. 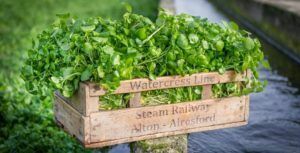 Since establishing our second office in Alresford in June 2012, Sousa Law’s involvement in the Watercress Festival has become integral to our work with the Alresford community and the support of locals and peers. Taste some of the first watercress of the season – either at your own pace or participate in the World Watercress Eating Championships! Enjoy a fine gin and tonic with fresh watercress at the Sousa Law stall and collect a helium balloon and a fun animal word search for your little ones – with the chance to win tickets to Marwell Zoo! Here at Sousa Law, we were proud to announce our participation in the 2015 Springboard Summer Abseil! In 2015 two very brave members of Sousa Law staff abseiled 262 Feet down London’s ArcelorMittal Orbit with an aim to raise £300.00 or more for The Springboard Charity! The Springboard Charity is a charity that deals with current issues such as helping young people achieve their potential by nurturing unemployed people of any age into work and helping alleviate poverty by supporting disadvantaged and underprivileged people into sustainable employment within hospitality, leisure and tourism. We also have an ongoing project to raise money for Headway Surrey – the brain injury charity, whereby our solicitors donate their swear fees. The catalyst being a local young man named Will, who at the young age of 16 suffered a life changing brain injury when he was the subject of an unprovoked assault. As a result of the assault his life was in danger, and several emergency operations followed. Will is now 25 and has made a tremendous recovery with the help of Headway. Over the last few years we have participated in several Free Will Schemes including Will Aid and “Make-a-will fortnight” initiative on behalf of Countess Mountbatten Hospice Charity. During this time we have waived our fees for writing wills in return for donations to the charities. We were overwhelmed by the generosity of our clients and thank everyone who has contributed. We look forward to participating in the schemes again this year and raising money for such worthy causes. To find out more about our will writing service go to the dedicated will writing page on our site or call us on 02380 713 060 (Southampton)/01962 670 510 (Alresford). We, at Sousa Law, are proud to announce that we took part in the “Make-a-will fortnight” initiative on behalf of Countess Mountbatten Hospice Charity. Between 19th and 30th May, we waived our fees for writing wills in return for a donation to the hospice. Our contribution of writing free wills raised £1025.00 for the charity and the whole event exceeded £9000. The Charity received positive feedback about our services and we were asked to support the event next year as well. Having an up-to-date will is important to ensure your wishes are known and your money and possessions go to who you want. Find out more about our will writing service by clicking here, or calling us on 02380 713 060 (Southampton)/01962 670 510 (Alresford). Thanks to my upbringing, from a very early age I was instilled with a view of the world which revolved centrally around equality. An equality that can only be obtained by the education of the masses and which in turn is only possible if everyone has the same opportunities to not only better themselves but their community as well. This has manifested itself in directing me now to want to work within the ‘third’ sector of charities and NGO’s. I grew up in the north west of England, near a place called Barrow, just on the western edge of Lake District. It is an area of the world that is rich in many things, such as the landscape and the good nature of the people. However one that it is not rich in is a steady and functioning economy, which has led to a high level of unemployment. Some of the young unemployed there are good friends of mine, people I have known from the age of eleven. I was lucky enough to be offered at a place at the local Grammar School in Lancaster, where I succeeded in attaining my A Levels. These grades enabled me to get a place at Goldsmiths, which is part of the University of London, to study Anthropology. I was at Goldsmiths for three years from 2010 to 2013. While I was there, ideas of social justice and equality that I had grown up with began to appear in key readings and were emphasised in lectures. I began to form a perception of society that it is far more unequal that we allow ourselves to acknowledge. I this it is fair to say that my eyes were opened; I began to question everything that I thought society was about and began to see everything in a new light. It was half way through my third year when I realised that I had to put these know found perspectives of life into action with my actual career. I have just applied to SOAS in London to read a Masters in African Politics, I want to get involved NGO and Charity work in Africa so I figured out I needed to deepen my understanding of the whole situation. As well as this I want to be able to work for hands on aid organisations working for change in different parts of Africa. I began to look for voluntary work, so that I could start to build up some experience within the third sector. I applied for The International Citizen Service (ICS) project and was accepted. The programme is in three stages and I am in the middle of the first stage which revolves around funding. I have a target of £1500 by late April which is my leave date. I now have £1200 with generous help of individual donations plus £250 from Sousa Law Solicitors, £250 from the Alresford rotary club and £500 from the George Gorman Memorial trust fund Solicitors. I am nearly there. Over the next month I am running a raffle at the Bell in Alresford, where I work, Earlier that day I will be attempting to cycle 100 miles in one day on a turbo trainer, that will be set up in the back of the pub. The second stage involves going to Malawi. We fly into the capital Lilongwe, then travel by bus 7 hours to Mzuzu in the north. There we will be split into groups and move in to our hosts houses, who will be around the same age as us. For the next 3 months we will help in the local schools teaching. We will also be working with young adults between the ages of 16 and 26 helping them develop a voice when it comes to concepts such as development and globalisation, allowing them to make their up their own minds working together looking for the best way forward for their communities instead of blindly accepting western values. The third stage lasts six months and starts as soon as we return back to the UK in late July. It revolves around taking what we have experienced in Malawi and bringing it back to the UK. We have to get actively involved in a community project similar to that we worked on in Malawi. From an early age travelling has been part of my life, may it be just travelling around England and Ireland in a VW camper, or flying to Germany. When I was Seventeen I attended a congress in Chiapas in South Mexico, on Peace Sustainability and Justice. This for the first time exposed me to different ways of life and how they have been affected in some cases by western values but also other forms of western ideas from Christianity, and the dangers that these amalgams can produce. This has made me very wary of introducing western ways of life into other societies whose cosmological belief are so very different. The ICS project centres on uniting young people from all over the world, encouraging them to become global citizens in a world that is very quickly changing. This is why I think it is such an important project, it not only benefits the individuals who are directly involved in it but also the communities which surround the people who are part of the project. I believe it will be an important step for me in my career journey to make a positive contribution to the international community, making a positive difference which will benefit all. Our Will Aid Scheme 2013 is now at an end and we have raised £940 in donations. Will Aid is designed to raise money for nine leading charities including Actionaid, Age UK, British Red Cross, Christian Aid, NSPCC, Save the Children, SCIAF, Sightsavers and Trocaire. We have donated our time in drafting and executing wills for our clients and in turn they have donated money to the Will Aid Charity. We are overwhelmed with the generosity of our clients and thank everyone who has taken part. We look forward to participating in the scheme again next year and raising money for such worthy causes.